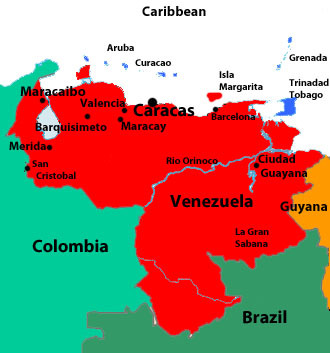 Venezuela located on the northern most portion of South America is bordered by the Caribbean to the north, Colombia to the west, Guyana to the east and Brazil to the south. The country of Venezuela lies to the north of the equator placing it in the Northern Hemisphere. Lying along the southern portion of the Caribbean, Venezuela can easily take on the feel of a Caribbean Island, with miles of Caribbean beaches and numerous islands off shore; it is easy to see why the country has taken on a Caribbean flavor. But don’t be fooled, Venezuela is still much a part of South America. From its history to the landscape of the country one will find strong ties to the rest of South America. Due to the low latitude of Venezuela, Caracas, the capital of Venezuela, lies at 8 degrees north and 66 degrees west, and its closeness to the Equator, Venezuela tends to see little change in climate. The country tends to be more tropical, hot and humid being the norm. Even though Venezuela lies just to the north of the Equator, one will find many similarities to other parts of South America. Snow capped mountains in the western portion of the country can be found as the start of the Andes mountains head south into Colombia and to the lower portion of South America. To the south, Venezuela shares the northern sections of the hot and steamy Amazon jungle with Brazil. To the east lie the Gran Sabana plateau, large jungle and grass plains giving way to steep cliffs rising to flat table like mountains. It is in the Gran Sabana region that one will find the worlds tallest free falling water fall, Angels Fall, which is believed to have a drop of over 2600 feet. Venezuela also boasts the largest lake in the world, Lake Maracaibo in the northwestern section of the country as well as the third longest river , the Orinoco, splitting the country almost in half as the river flows from the southeastern boarder with Brazil to the Caribbean. From palm tree beaches to the jungles of the Amazon, one will find a variety of plants and animals thorough out the country.